In 2016 Elise completed a Master of Arts (Research) at Queensland University of Technology (Part-time). Shifting lenses: Investigating interdisciplinary approaches to the use of the moving image and digital media in live performance. Her research investigated the intersection between traditional modes of dance performance and other screen-based, interdisciplinary and hybrid approaches to the use of digital media and live performance. The use of digital technologies is becoming ubiquitous in contemporary dance performance practice, however rigorous questioning of the theatrical cohesion of live bodies, visual projections and digital technologies is still in its infancy. 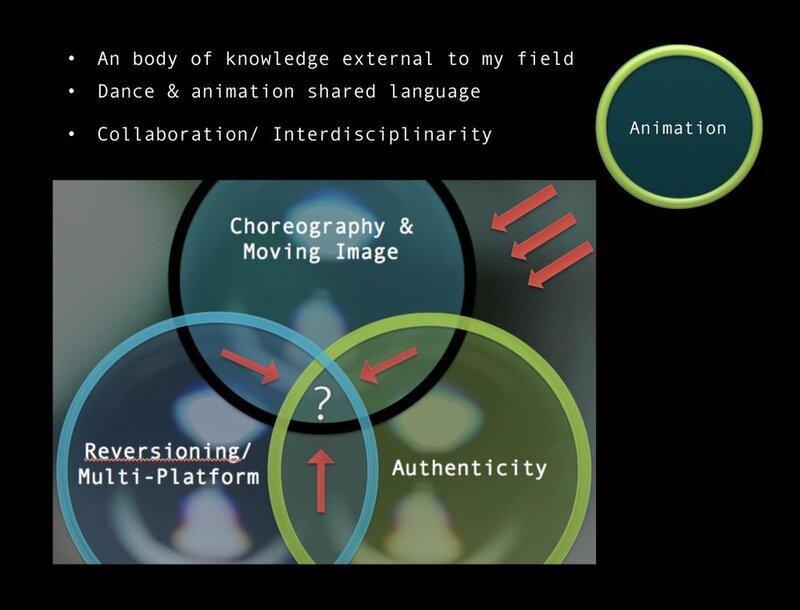 Through the lens of an embodied choreographic practice this research examines interdisciplinary perspectives on the intersecting knowledge fields of choreography, moving image, animation, installation and interactive technology. Utilising practice-led strategies, Shifting Lenses, a solo performance installation tested new and experimental relationships between movement vocabularies, digital projection, interactivity, and performance design; leading towards future development at the nexus points where digital technologies meet the body in live performance. Dance. Moving Image. Animation. Technology. In April 2016, I was lucky enough to catch a video screening of documentation from Shifting Lenses, a solo digital performance installation by May at QUT’s Parer Place in April. The installation was an immersive, engaging experience that was unlike anything I had ever seen before. I was unsure what to expect as I approached the screening, which could only be viewed at night, the darkness illuminating the projected images. What was projected saw May as a solo silhouette dancing in front of a shifting backdrop. There was a synchronicity between her fluid movements and the digital background. Through a Masters by research at QUT, May has been investigating the use of technology and dance. Collaborating with animator Paul Van Opdenbosch, May developed an experimental and embodied practice-led research inquiry that examined interdisciplinary perspectives on the moving image, animation, installation and interactive technology. The process of collaboration with Van Opdenbosch allowed May to experiment with motion capture technology where she could see her form and movements from any angle, represented digitally in motion capture software. Opdenbosch then created animations from her movement data. 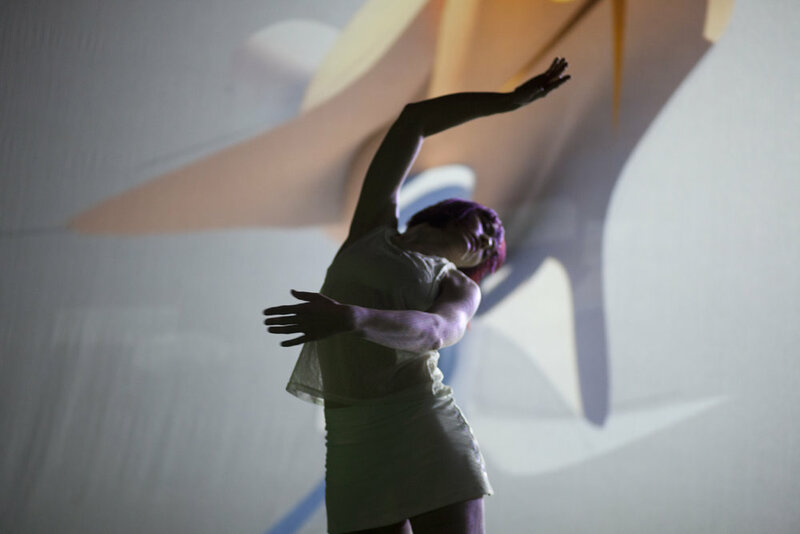 “We were feeding the data from my body into the animation process [to create] these beautifully abstractive sometimes geometric, fluid and twisted shapes and really abstract concepts started coming from the body’s movement,” she explains. Shifting Lenses incorporated three experimental animations that used XSENS motion capture technology in order to create generative animation outcomes. Van Opdenbosch explained that the suit uses the “same technology as the iPhone. It knows the rotational plane against the Earth’s magnetic core”. The performance experimented with the concepts of both analogue and digital, in incorporating content that moved both towards and away from technological input. “For a long time I’ve been interested in film and video making and this kind of marriage of digital technology or video with live body in performance,” says May. Ultimately, May created an environment where an augmented reality of merged digital and live worlds encouraged an experience of heightened presence and embodiment through an intimate shared space between the performer and audience. I was curious to learn from May how she developed the concept for Shifting Lenses. She explained that she wanted to explore screen-based and interdisciplinary approaches to the use of the moving image and digital media in live performance. While developing a digital element, May was also conscious of not going completely into the realm of technology. “Trying to move it in both directions, both towards the digital but also back away from the digital,” she explains. This was clear through the use of both analogue and digital methods. For example, May used an analogue approach through constructing a screen-like space without the use of technology. Using a tower of mirrors, May was able to create a chronophotographic effect (a set of photographs of a moving object, taken for the purpose of recording and exhibiting successive phases of motion), from video motion capture without any digital input. She explains that the mirrors offered a “splintered, broken down compartmentalised view of the body against a very organic, real, fluid moving body”. She explains that the mirrors offered a “splintered, broken down compartmentalised view of the body against a very organic, real, fluid moving body”. One of the other sections of Shifting Lenses that May worked on used a piece of software called E-motion. E-motion is a wire frame grid but uses an Xbox Kinect sensor, which uses infrared technology. Van Opdenbosch explains that “the Xbox sensor uses a depth sensor, so it registers how far away any part of you is from the camera and kind of renders out this grey scale, white’s closest black’s furthest away. The system would basically take her silhouette and move things around it”. May was interested in creating a similar sensation utilising existing technology and the human body. “I experimented with this interaction, I wanted to achieve the effect of the body dancing in a duet with technology,” she says. May explains that the intersection of dance and technology is moving beyond the early stages of experimentation – a body in front of a screen – towards what she perceives to be more exciting, integrated experimentation where dance, video and technology meet. May realised at a young age that she wanted to pursue a career in dance. “I was really drawn to live performance because of the energy and the tangibility of performance”. This led May to study a Bachelor of Fine Arts in Dance at QUT. After which she built on her performance and choreography skills as a freelance or independent artist. Her exploration into the marriage of technology and the human body may just be the tip of the iceberg and it’ll be interesting to see how these two fields will intersect in the future. The data points in the following video correspond with the physical form of the human body. In generative animation, the animator uses data to set up ‘rules’ within the virtual environment or 3D space. By taking away the real world physics such as gravity, this cloth-like artifact behaves in a way governed by the data pre-sets and therefore ‘generates’ unexpected animated qualities. After our time logistically working out our collaboration might work, we decided to explore how the data might be interpreted visually. These experiments were our first outcomes in the collaboration process and were a testing ground for what might be possible. This animation is one of the outcome of preliminary experiments through practice aiming to explore the collaboration of a Dancer/choreographer with an Animator, along with enquiry into the intergeneration of motion capture technologies within the work-flow. The animated visuals derived from the motion capture data are not aimed at just re-targeting of movement from one source to another but looks at describing the thought and emotions of the choreographed dance through visual aesthetics. My research will be informed by a practice-led enquiry, open to interdisciplinary exchange, drawing on reflective observation and practical investigations in the form of installations, collaborations, screen dance and live performance works. b) a body of work which is of high quality, contributes to the growing body of knowledge within the industry and shows clear conceptual innovation and merit. I am looking towards a sustainable career as an artist, and I would like to find deeper connections to the form, acquire new processes, skills,audiences for my work, and career opportunities through my participation in this research. 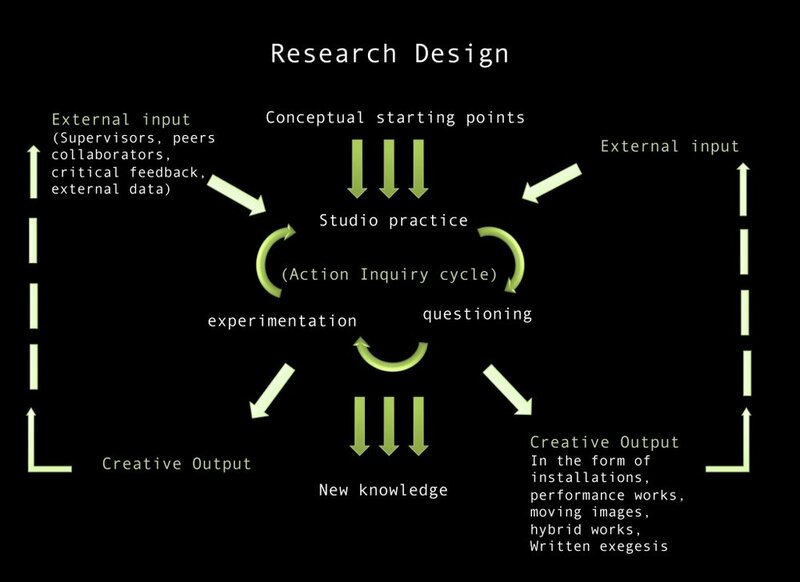 My research methods will consist of practice-led investigations through my studio practice and contextual reviews. I will site previous relevant research, current and future creative works as ‘case studies’ to ground my investigation and provide a context for my written thesis. I anticipate that my research and written reflection/ analysis will “co-exist” running parallel to my practice, informed by my practical investigations. Likewise I hope that my studio practice will be informed by my research objectives. I would like to structure my research in such a way that reflection, discussion and articulation of key concepts are built into the process, and that there are points throughout the duration of the research where evaluation and reassessment of the key research objectives are revisited, reviewed and re-framed in order to move forward. I am also interested in methods of creation and documentation such as “re-working”, working with a series based approach, or “re-versioning”, a term used to describe a process whereby digital information may be copied from one platform to another without corrupting the original coded content. (Howkins, John (2001) The Creative Economy). 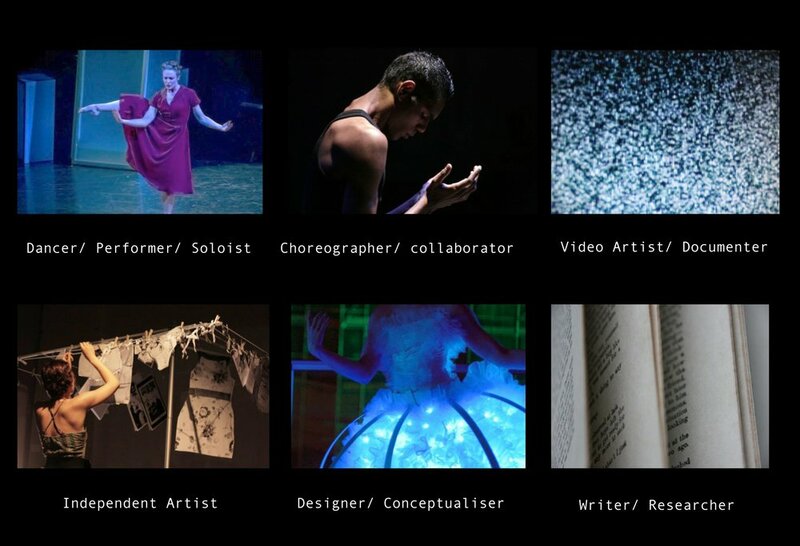 These models invite interdisciplinary and collaborative approaches to dance-based work, but also focus on the empowerment of the artist or creative practitioner, whereby a choreographer can 'up- skill' and diversify their knowledge base in areas where dance & movement knowledge is transferable and is an asset, and can be used to develop an interdisciplinary vocabulary and expand the possible audiences, networks and contexts for their work. My choreographic practice has always incorporated video and moving image. Intuitively I have been drawn to exploring the ways in which images and the live performative body can co-create meaning. This is where I anticipate that I will unearth valuable new perspectives resulting from the multiple lines of questioning triangulated with very individual findings investigated through practice-led enquiry. Furthering this quest for new knowledge, the unique perspectives that will arise from a collaborative process with fellow researcher and animator Paul VanOpdenbosch will fuel the development of the research. Stock, C.,Philips, M & Vincs, K. (2OO9). Dancing the Thesis: Potential and Pitfalls in Practice-Led Research In Re-Searching Dance: International Conference on Dance Research, New Delhi. pp53-59.